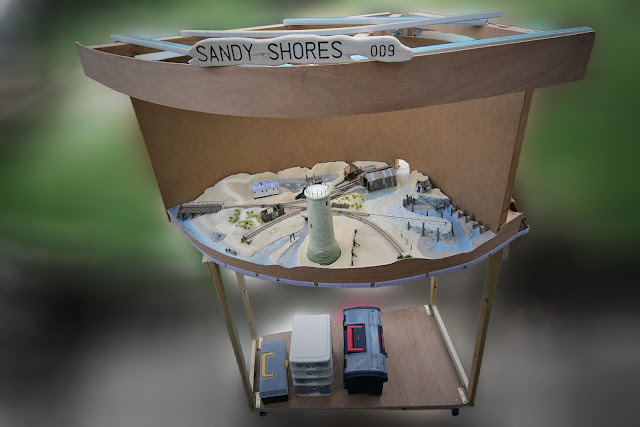 Almost a year ago when I took Sandy Shores for its first ever exhibition, a visitor politely suggested that perhaps the tidal area of the layout looks far too blue considering it is a mudflat. I seem to remember that I originally painted it whilst trying to judge colour from photos found online. 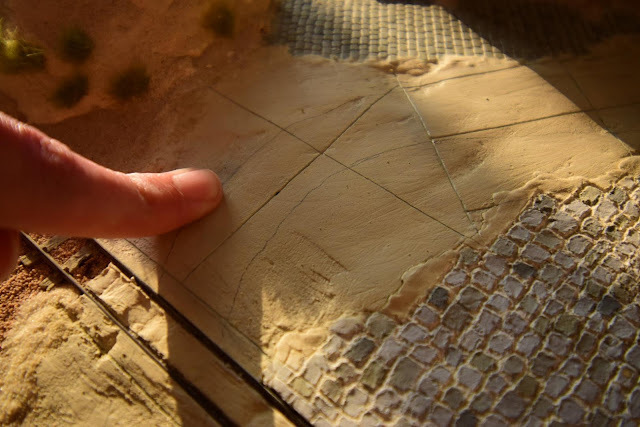 Knowing that it would soon be necessary to pour a deep water layer over the top of it, and with that comment still in the back of my mind, I thought I should do some research. Turns out, the visitor was of course right, any water in tidal areas amongst mudflat is incredibly... well... muddy! I think the reason I got it so wrong originally was that I relied mainly on photos taken from sea level (or just above), which of course meant that the water was reflecting blue sky! 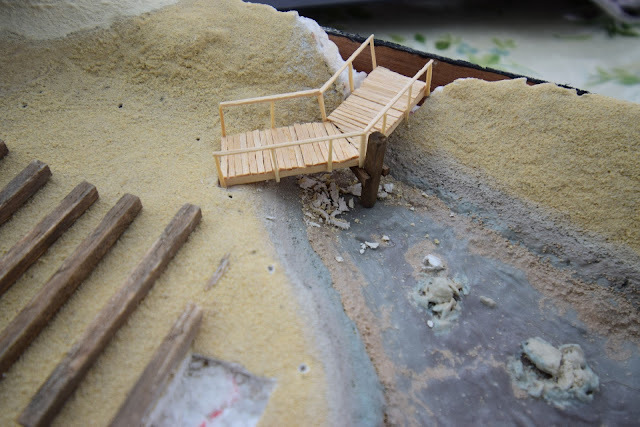 As this tidal area had several layers of PVA on it, repainting it was not an option. 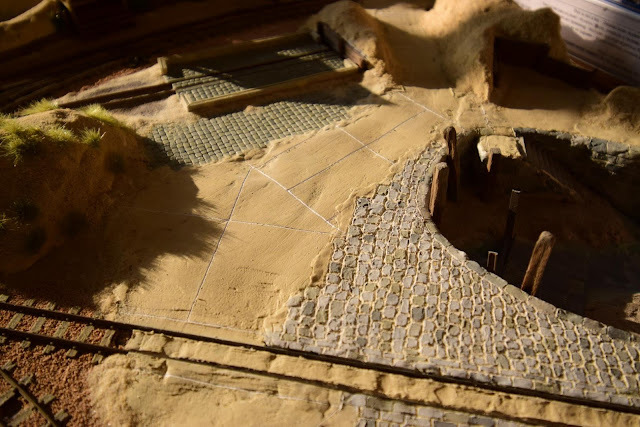 I was also acutely aware that the depth of the sunken areas was all over the place; thus any deep pour "water" would collect in one place rather than spread equally across the whole area. 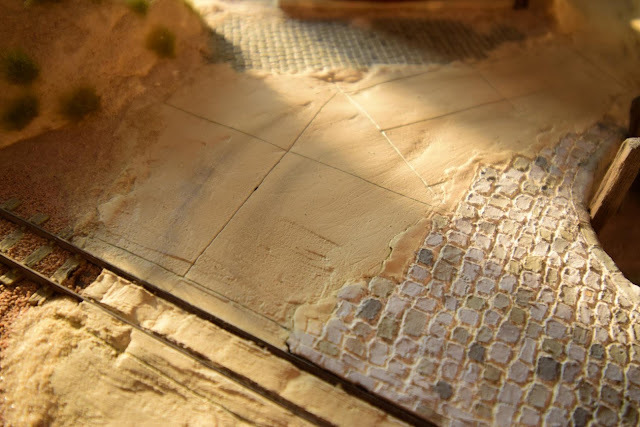 Whilst I had some leftover filler, I decided to extend the concrete road off-scene. By curving the road back out of sight behind the backscene, I'm hoping it will help soften the harsh transition between scenic and non-scenic sections of the layout. This was constructed in exactly the same way as the existing road. I'm also tempted to add some solid fencing and maybe a sand dune right at the back to help the effect further. My attention then turned back to the grounded carriage, where I began work by adding tension posts to every corner of the fencing. Some of them are perhaps a little too thick, so I may come back to these another day, but I was keen to press on to the next thing: a footpath. 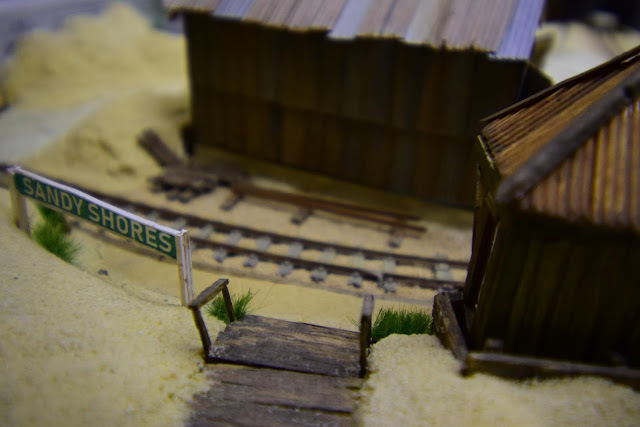 Originally I planned a quick idea of just pouring ballast onto the sand and then blending in the edges with sand... however, things somewhat escalated! 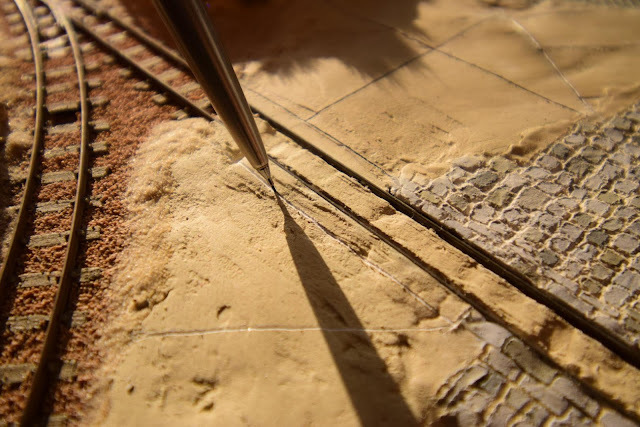 The first thing to do was to roughly mark out the path with a mechanical pencil; making my way from the porch to the new boardwalk at the back of the layout. This is where the process became a little destructive as I scored the ground and lifted up the surface layer. Unfortunately, the end nearest the boardwalk was surprisingly soft, and the knife went straight through into the polystyrene, damaging the end of the fence in the process! Thankfully it wasn't lasting damage, and the rest of the ground was removed without issue. As you'll see in the photo montage below, I kept making life difficult for myself, this time by deciding the path would need an edging. 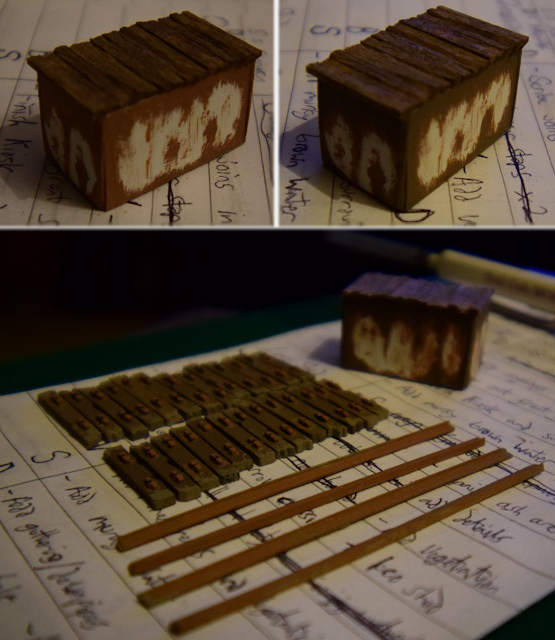 To do this, incredibly thin strips of lollipop stick were needed; barely being bigger than splinters! 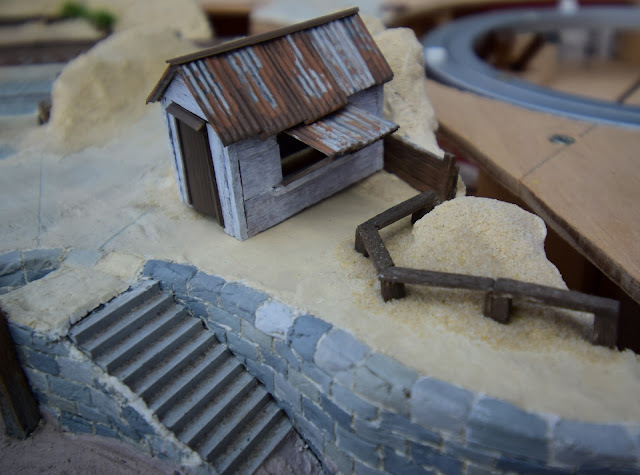 It may have taken a while, but it resulted in clean edges with which I could then fill with gravel (ballast). And there we have it; two days of progress in one post! 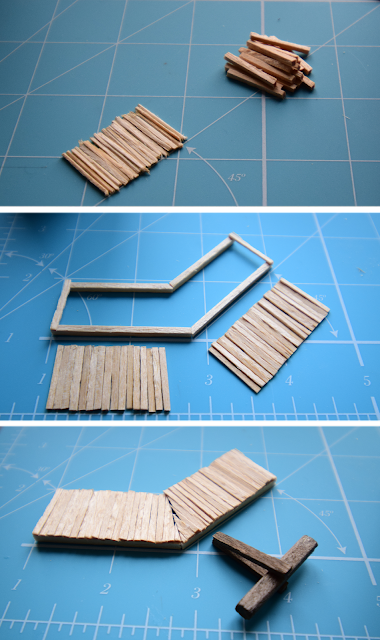 Making a post & wire fence, plus another boardwalk! This is one of the jobs that has been going on for the past few days, but there wasn't really enough to show per day to warrant spending a whole blog entry writing about it. However, today I made enough progress to show my latest fiddly nightmare! As you can tell from the post title, I decided that a post and wire fence was needed to mark the boundary of the grounded carriage house. The first part was easy; cutting up lollipop sticks into fine posts using the handheld chopper tool, and then painting them with my usual method. The difficulty suddenly escalated when it came to attaching wire, as I had originally intended to drill tiny holes in each post to accept wire. I soon realised that even if I could find a drill bit small enough, I still didn't have a chuck small enough to take it. Given that around here (and probably all over the country), most post and wire fences have their wires actually attached to one side of the post with galvanised U shaped staples, I figured I could do something similar (albeit without the staples!). The first step towards this was clamping the beading wire under tension to the glass work surface (which has made taking photos pretty difficult, sorry!). My first attempt (above) wasn't particularly successful past the first wire; I was going to need to find a stronger and better way to do it as the wire would keep coming loose once I tried to adjust the tension on one. The tension was crucial to getting the wires at the correct spacing (see the cardboard jig below:), which were measured out to prototype heights. With that settled, I thought I'd go for as simple a method as possible, and settled for experimenting with PVA glue to hold it in place. After having left it to fully cure for two days (whilst I painted the layout fascias etc), I came back to it today to check its progress. The mess underneath the boardwalk shows that some of the sand dune needed to be cut away to fit the wide boardwalk. I later smoothed up the remaining hole and mess with some Polyfilla. (It'll be left to dry/harden overnight before I paint it and cover it with sand). Anyway, the test fit above proved that the left handrail would need to be modified at the rear so that there was less chance of it getting damaged when the backscene gets slotted into place for exhibitions. As the sand dune was relatively high here, I decided the easiest solution would be to have this handrail drop down to the base. It remains to be seen whether the same treatment will be needed for the other side, but for now it stays as-is. To finish off the boardwalk, it was of course time to paint it with my usual method. The above photos came out a bit too vivid (my own fault), but in reality it's a nice muted wood colour. Note the light sand colour added onto the end of every plank to give that sunbleached look. It looks a lot more effective in person than it does in the photo above! So that ends today's progress, and with the porch having had its concrete foundation bedded in, it was time to let everything dry overnight. I had planned to fit the guttering and such onto the carriage, but that can wait till tomorrow! 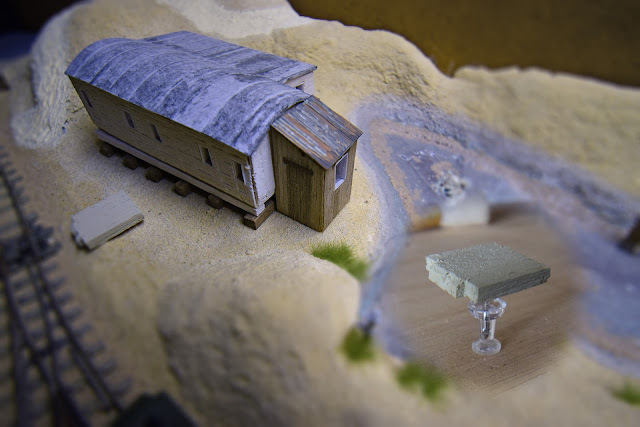 Whilst I only have three photos for this entry, it is the culmination of the past two days of almost solid work on the layout. During the daytime I've spent about 8 hours (spread over both days) painting the layout fascias and trolley. Whilst my original plan was to whitewash the fascias to match the layout theme, I decided in the end to go for a dark grey. 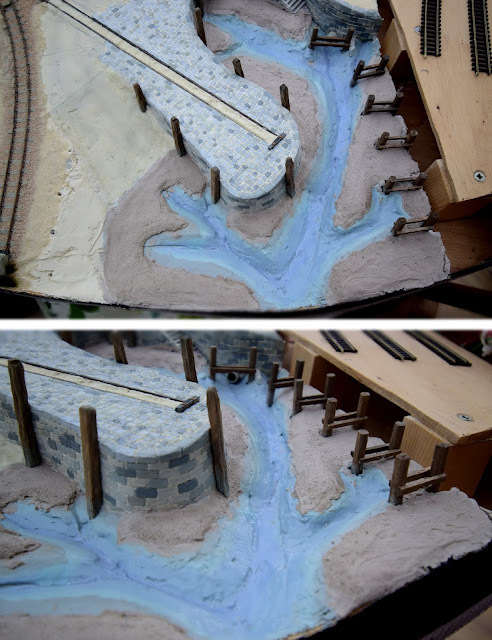 It may sound like a bold move, but the idea was to make the layout "pop" a bit more, and also to give a better protection for the woodwork than a thin wash would've done. Whilst I could've attacked the softwood with a wire brush or the Dremel to give it that tatty look, the ply fascias were already thin enough without gouging out chunks! I'd much prefer to have a layout with structural integrity. Whilst the grey is quite a bit darker than I expected given the colour on the tin, it definitely does the job of making the layout stand out from even the busiest of backgrounds; which is no bad thing. It may seem weird to have a mix of the very tatty nameplate right next to the very smart dark grey fascias; but actually, I think it's all the better for it. I'm sure it would look equally intriguing with a whitewash finish, but I dare say it wouldn't quite make such a dramatic impact as this "theatre" approach will. To finish off the neat presentation, my mum has very kindly offered to stitch the Velcro onto the stretchy light grey fabric tomorrow (that we bought the other week). The plan (as it currently stands) is to fix a bit to the front of the layout (as you can see from the white Velcro on the fascia in the photo above). I will also probably fit a piece to the back, although it will be slightly short of the left hand side because the backscene and lighting pelmet support gets in the way. 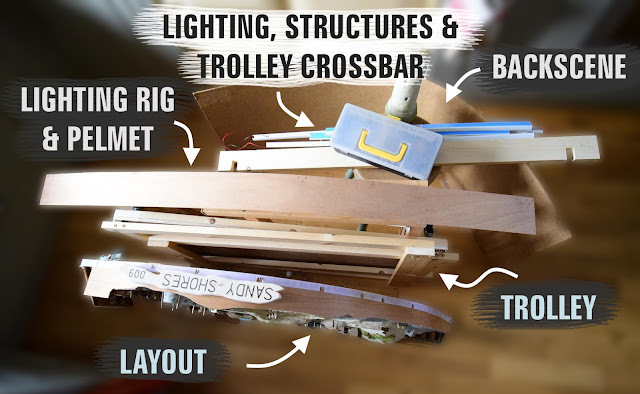 On the right hand edge (by the fiddle yard and control panel), there is currently no plan to fit any drape due to both the awkward restrictions on that side, and the need to access the trolley tray on occasion. And to end off the post, I've also spent my evenings sprucing up these four wheeled carriages that have been looking somewhat forlorn in recent years. I took the opportunity to paint the metal straps in a darker grey (a very fiddly job! 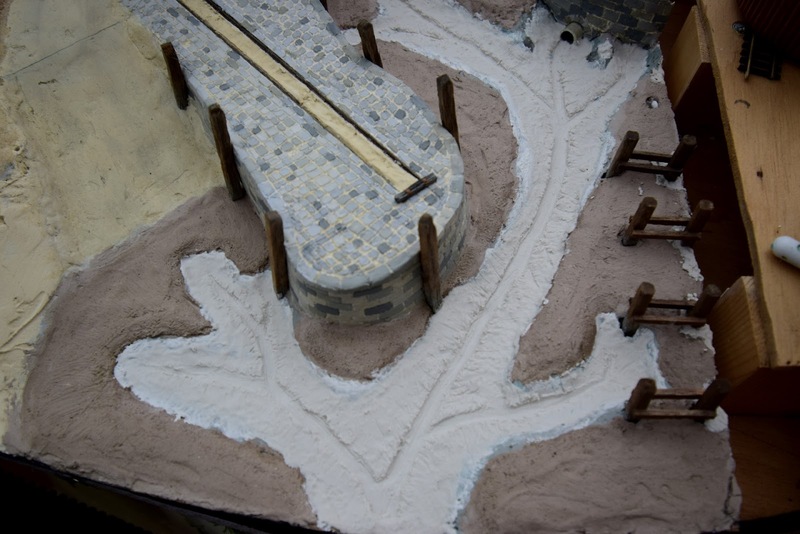 ), and I also fitted new "felt" roofs with tissue paper and a wash of various shades of grey. As I'm relying only on an up-lighter for light in the photo below, the light levels are all messed up; in reality the roofs don't quite look so pale and naff! And with very limited time left until the exhibition, it's about time I got on with finishing the scenic side of the layout! Despite the 4 days of progress, there's just a small update for tonight as there are some jobs that are half-complete that I'd like to complete before showing the final results; it makes sense to try and keep things together; especially when it comes to archiving. c) It looks suitably tatty and homemade! 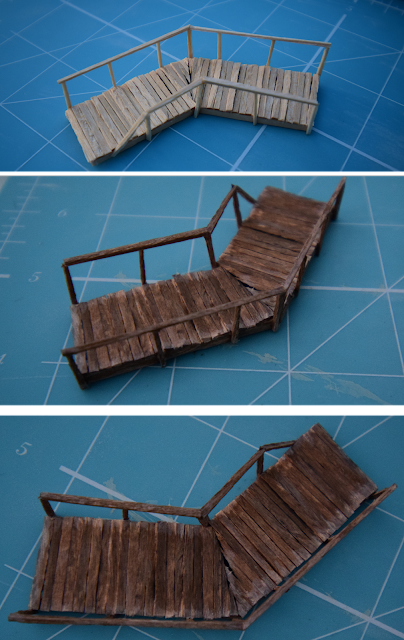 And as for the title of this post, another smallish job on my list was to create a porch for the grounded carriage. I wanted something that looks like a later addition, but I also wanted a porch of wooden construction, with a corrugated iron roof. Despite being a small structure, it still took a long time to build. 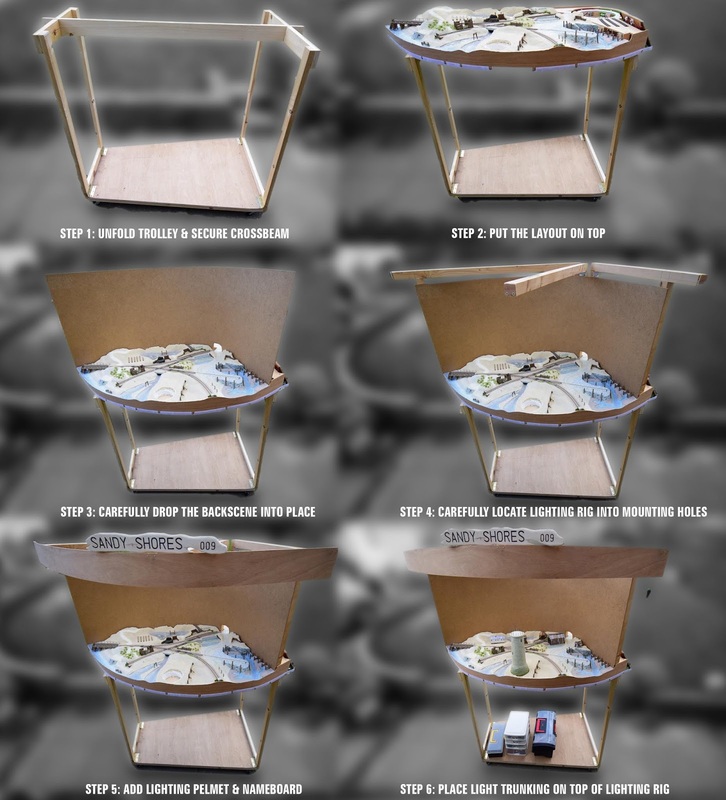 As with all structures, the first step was to create a cardboard mock-up to check dimensions against the existing building. 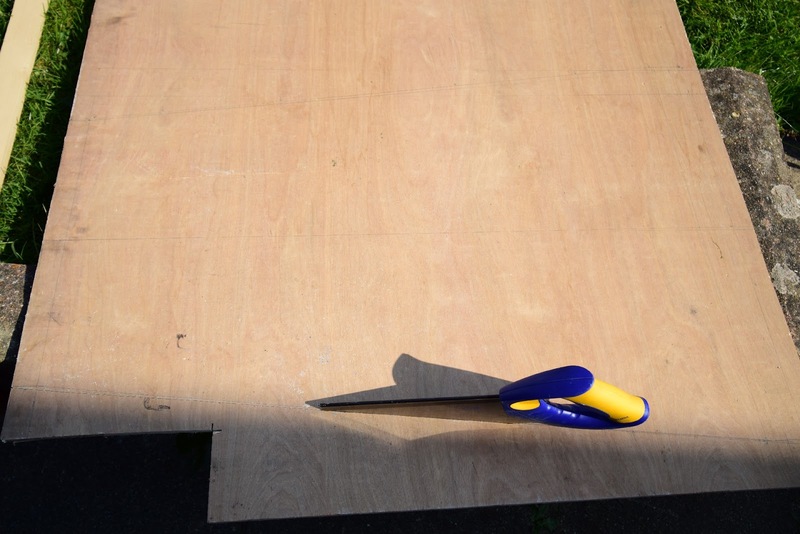 All was well, so it was then time to transfer the mock-up onto balsa wood, where I could then cut out the window and scribe the "planks" and create a base. 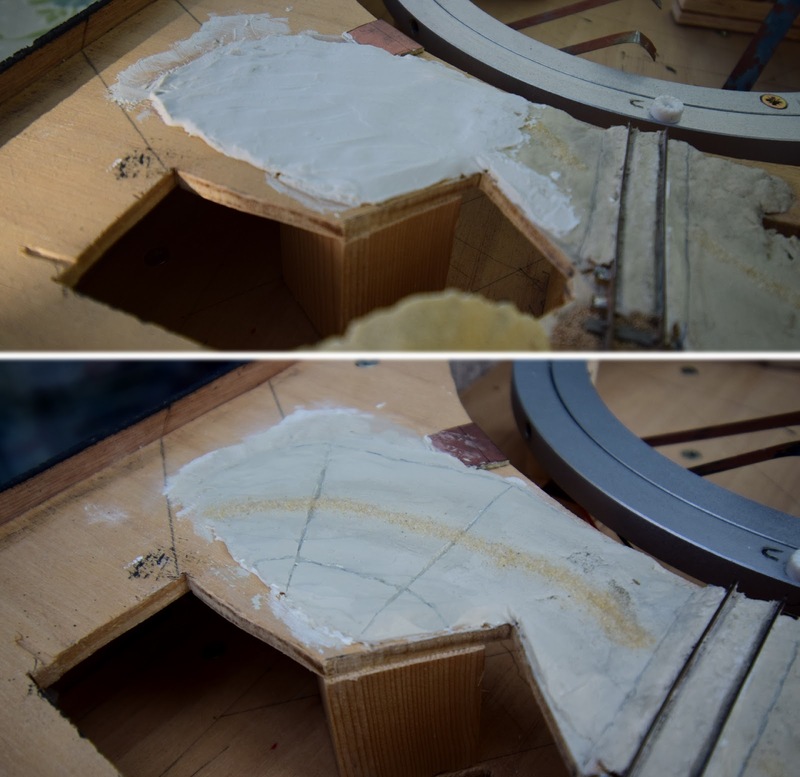 Initially, I had planned to make a separate door from plasticard (just like the kiosk), however, I remembered that the grounded carriage had its doors created by pressing in with a blunt tool to create a relief; so the same was done here. 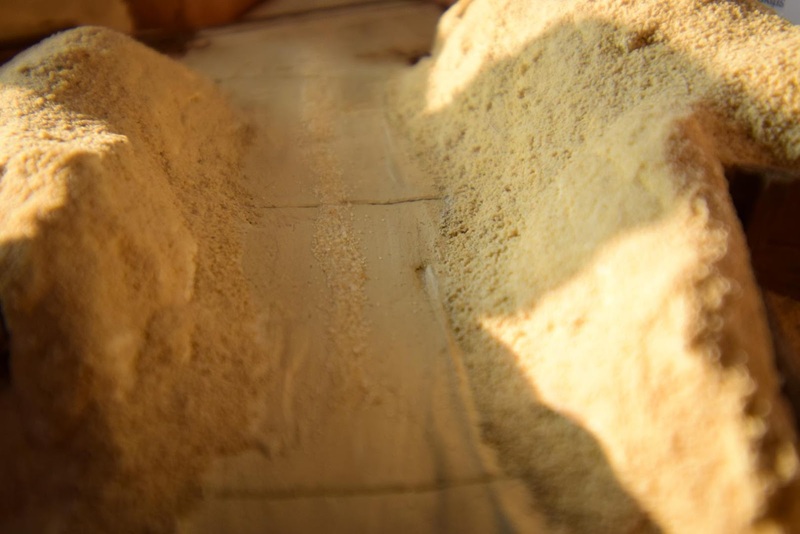 After that, it was a case of mitring the corners (cut with a small saw, then any slight adjustments made with sandpaper). So that's it for tonight; more tomorrow though! ...then so can you! 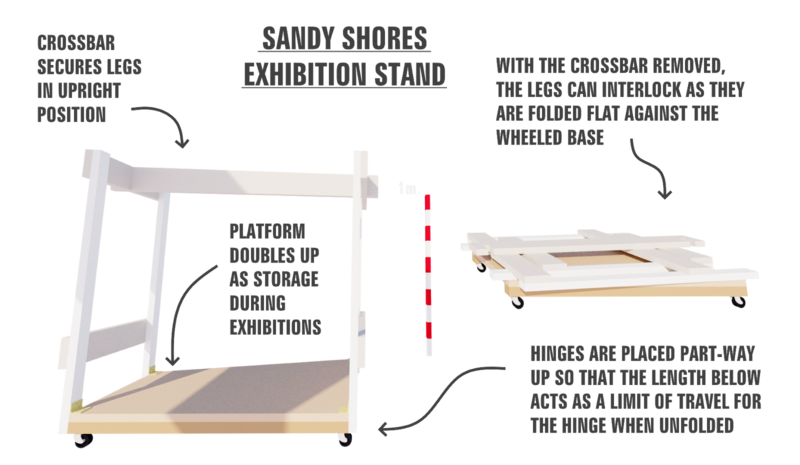 Seriously though, whilst the 3D design could put some people off straight away, in reality the woodworking is not complex at all. 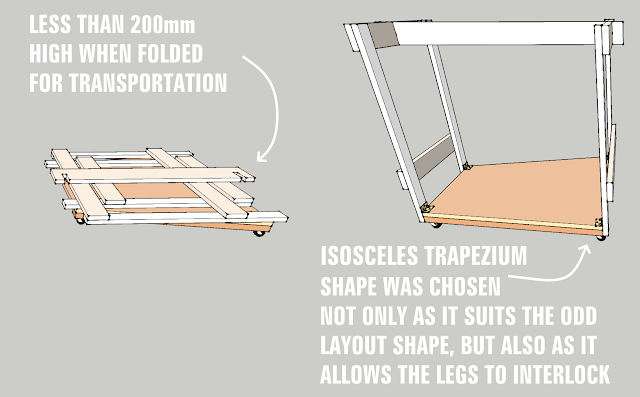 Each leg is made of 4 lengths of wood; no fancy joints necessary, only glue and screws! Not the best choice of saw, but it was either this or wait 5 hours for dad to get back! Surprisingly though, even with my terrible accuracy for sawing, I (eventually) managed to cut a straight line. Happy days! The two legs were cut out in a much more timely manner. The notches in the top braces were simple to cut; first the two edges were sawn down to the correct level, then multiple cuts between the two were made to break up the notch into many segments. With a wobble of the saw and a few quick (and careful!) knocks with a mallet and chisel, the notches were finished. 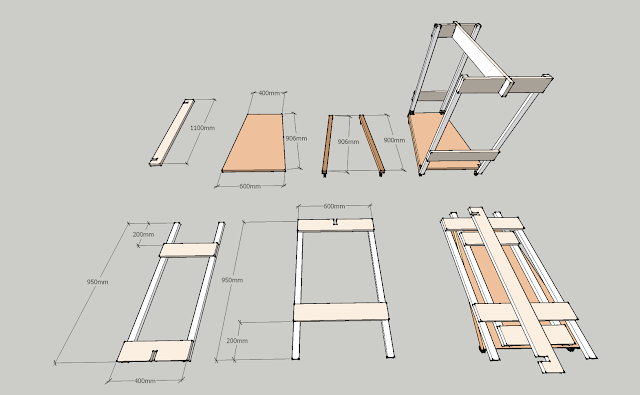 And here we have all the components cut out and ready for assembly. An important thing to note is that the crossbeam (at the top of the photo) hasn't had its notches cut out yet. This is a job I purposefully left until last; I didn't want to cut the notches too early and realise that they were not quite in the right place after I had assembled the rest of it. 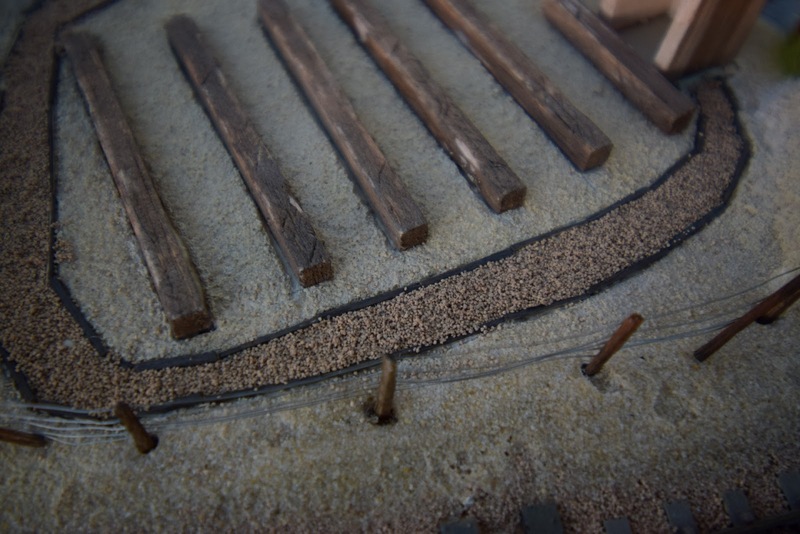 This crude close-up shows that every screw was countersunk into the wood; I like to do this wherever possible (i.e. 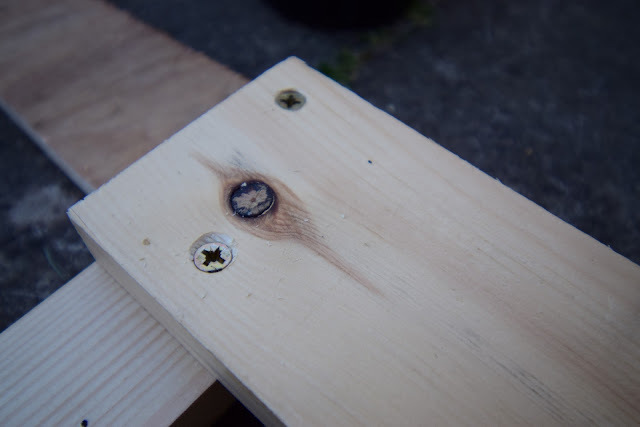 whenever the wood is thick enough), not only because it looks neater, but also because it reduces the risk of things getting snagged on screws that poke out! The top braces were only screwed, whereas the bottom braces were both screwed and glued; I figured that screwing into end grain was not enough to ensure rigidity of these crucial joints. 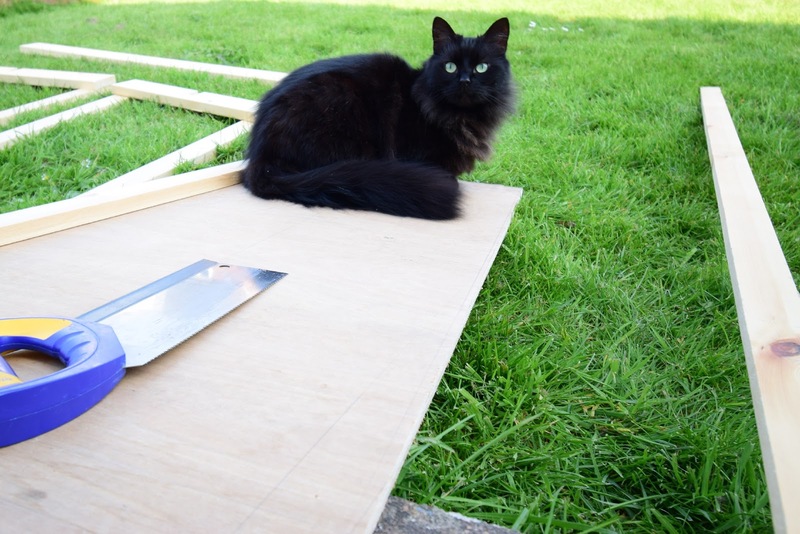 By the time I resumed work after dinner yesterday, it was getting dark, so there are no photos of the rest of the construction process (so instead here's a photo of Freda sat on it again!). 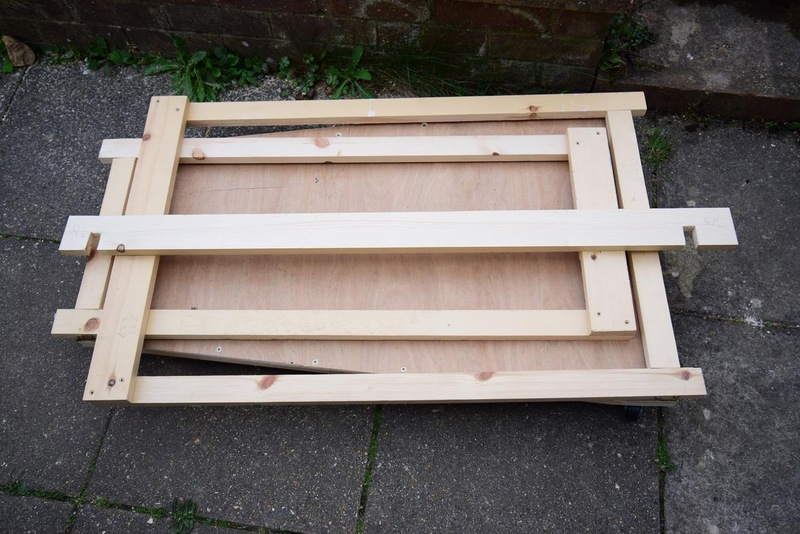 That said, there's nothing much to explain; the ply base was simply screwed onto the battens, holes drilled for the castors to sit into, and the hinges were attached (by my dad to save time due to fading light). 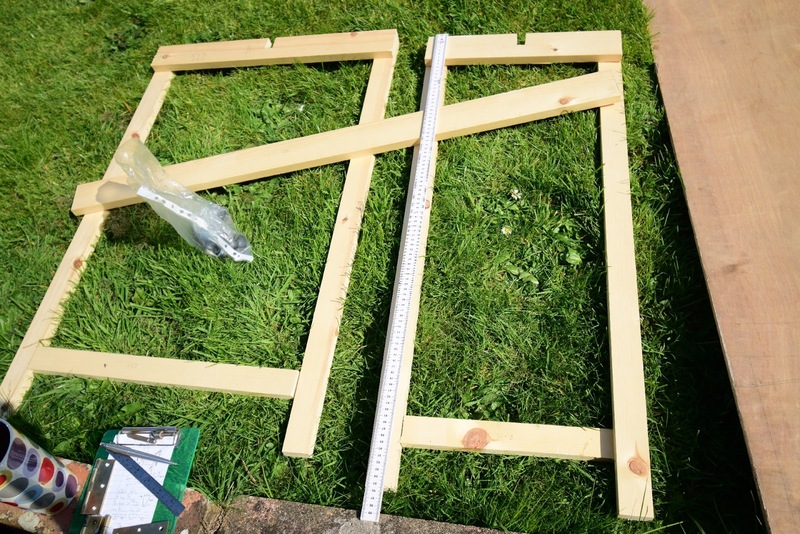 The crossbeam could then be marked correctly, and the two notches cut out. 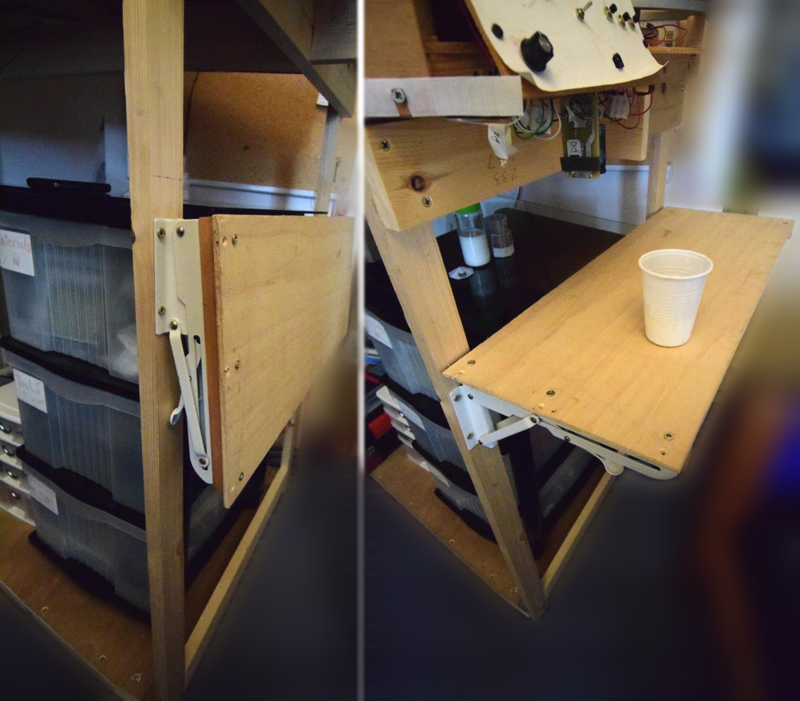 Happy with the trolley, I assembled the layout back into my room, where I began tidying up. 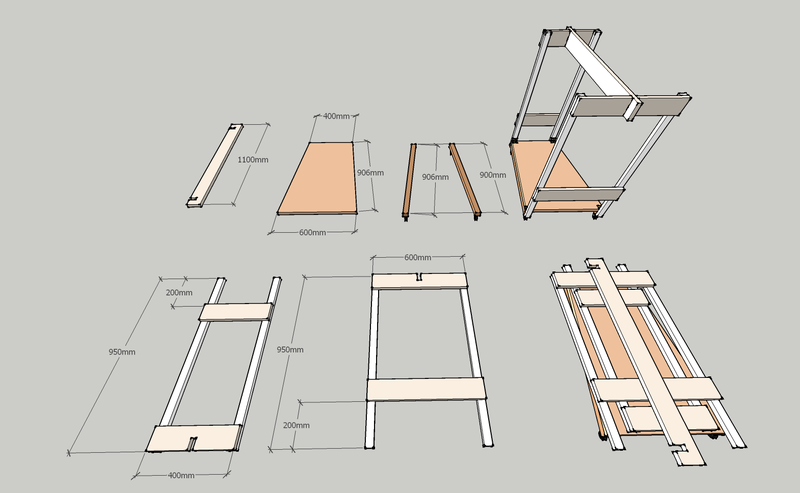 I then found some collapsible hinges from a project never started; perfect I thought, I could use them to make a drop-down tea & cake tray (and maybe also rolling stock if I can find some edging strips)! And yes, the control panel needs a lot of attention; a new legend printed (as the old one has curled and faded immensely) and the CDU glued back into place! In total, that's 24kg; still 1kg under my "portable" MIDI (music) keyboard! Obviously that doesn't include stock and buildings (not that I'll be carrying everything in one go! ), but I still think it's not an outrageous weight. Sure, I could've used lighter materials (i.e. 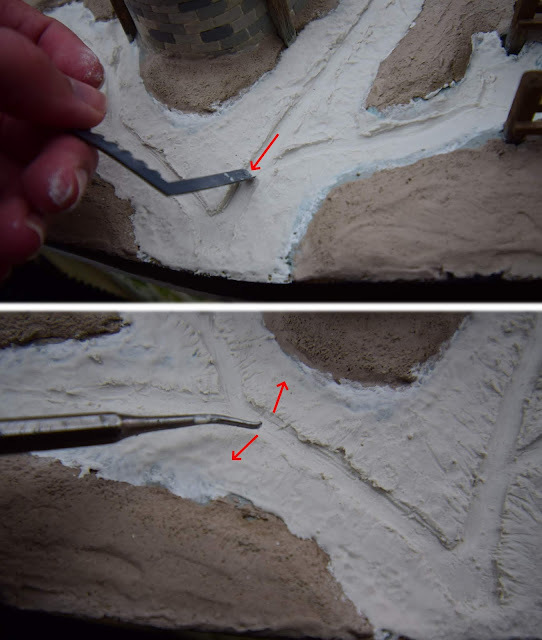 plaster instead of clay), but the layout isn't particularly big; and as I'm the one who has to transport it and put it up/take it down on my own, if I'm happy then realistically that's all that matters! 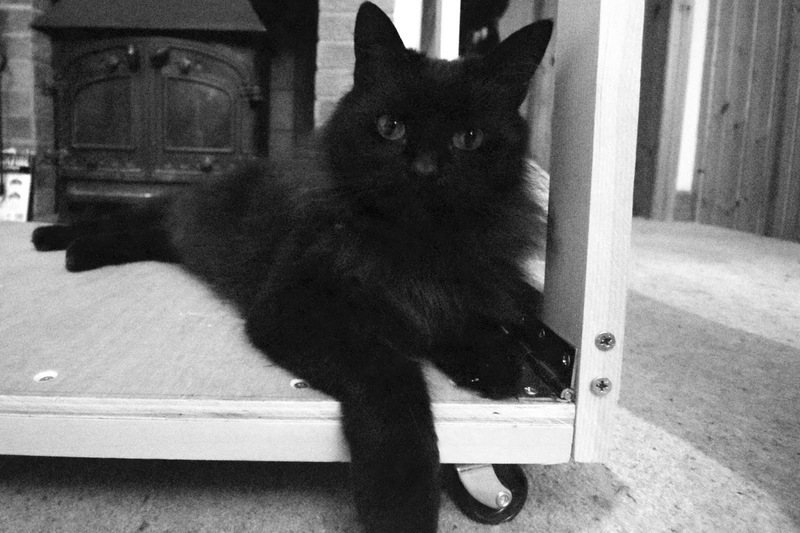 And no, before you ask; I'm not on about my own legs! My original plan for Sandy Shores was to produce a plywood box capable of not only containing the layout and its accessories in its entirety (as well as acting as a rolling suitcase of sorts), but also of acting as the layout legs (by being up-ended). Sadly, in the end, the layout box would've been too large to act as the layout legs as it would've created a layout that was too high for wheelchair users to see. Obviously with two upcoming exhibitions, and fabric for the layout drape ready to cut out (I've actually just glued the Velcro for it onto the layout fascia), it's about time I found a new option for the legs. I did go through a number of options in my head; including reusing legs from Old AGWI Rd. or extending the existing temporary trestles I've had for 12 or so years! Sat on the floor looking up at Sandy Shores I quickly realised that reusing legs was a no-go. 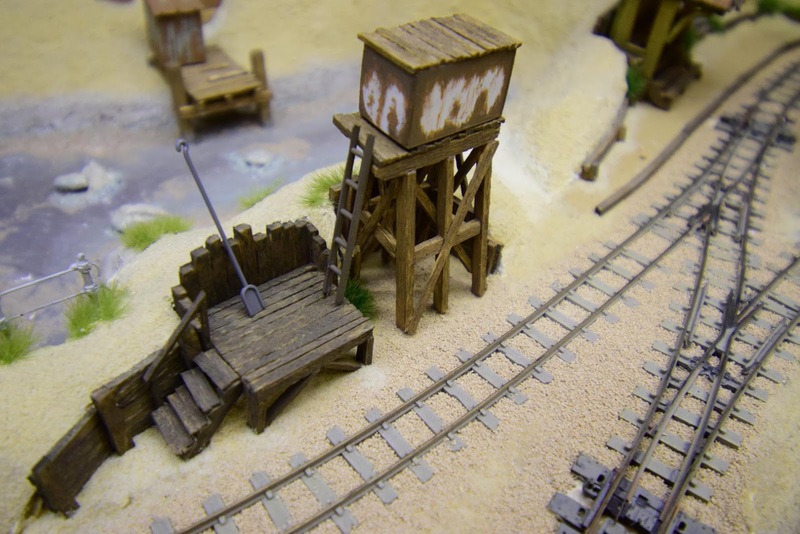 I also knew that trestles would be too wide at the left hand end of the layout, and would cause a trip hazard. As I mentioned earlier, the left hand end of the layout meets to a point, so any traditional layout legs would be unsuitable. 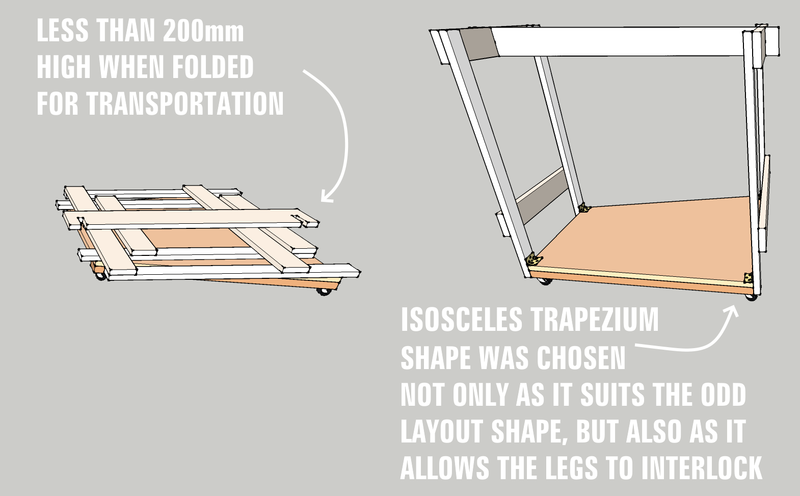 To rectify that (whilst still giving enough stability), I've designed the base of this design as a isosceles trapezium - happily, this also meant that the layout legs interlock perfectly; with the narrow set sitting inside the wider set. 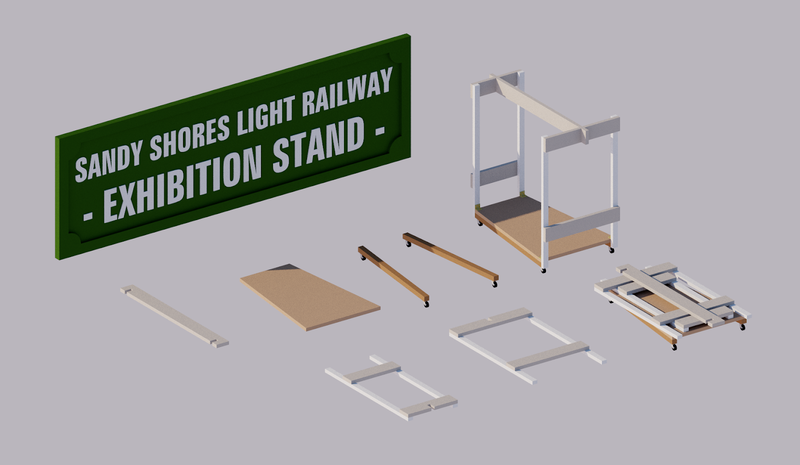 So all in all, it's still (I personally think) a relatively simple set of legs; and the fact I can store boxes and such underneath the layout with ease is the icing on the cake. One last thing to point out is that to stop the layout moving once set-up, it would be no hassle to fit those castor cups under the wheels; they can be bought incredibly cheaply nowadays. 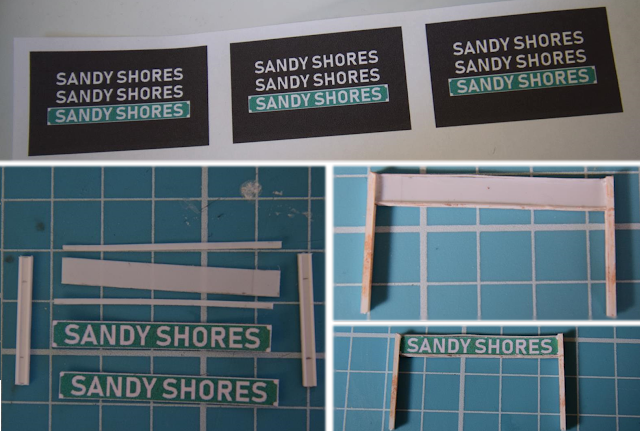 Sandy Shores - Small details, big results! 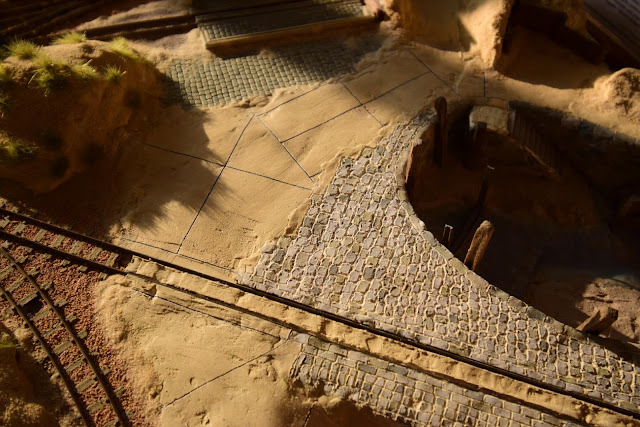 Today has been a very productive day, and somewhat surprisingly it's all the small details that suddenly seemed to have make a huge impact to the atmosphere of the layout. Suddenly, it seems as though the layout has a firm identity. And speaking of which, here's another nameboard! 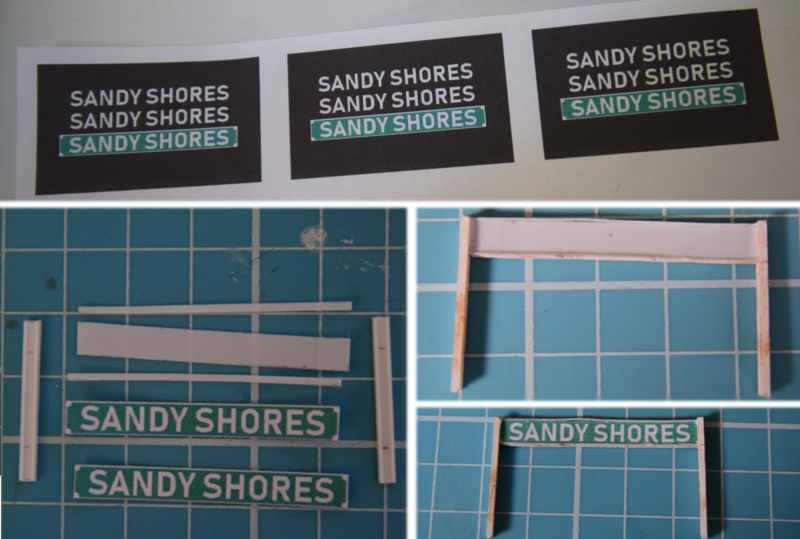 Yes, Sandy Shores finally has its own running-in board. I've been looking at the station area for a while trying to work out (aside from the marram grass on the dunes behind) what was missing. Two things popped into mind; one of which was the running-in board. Naturally, being on a shoe-string budget, the SSLR would likely have used whatever they had lying around; thus spare lengths of rail would form the main supports. In hindsight I think the rail lengths should actually be covered in rust rather than a slight streak as shown above. Oh, and in case you were wondering, the lettering was made in Paint.NET and pasted into a word document before being reduced to the correct size. I was considering adding raised letters (hence the white text on the grey background), but I couldn't bring myself to try cutting out the letters! In hindsight, perhaps there could've been an extra bit of spacing between the words, but it's good enough for now. It worked well, but was far too dark; and I didn't like the idea of painting thin lines with a more subtle colour. 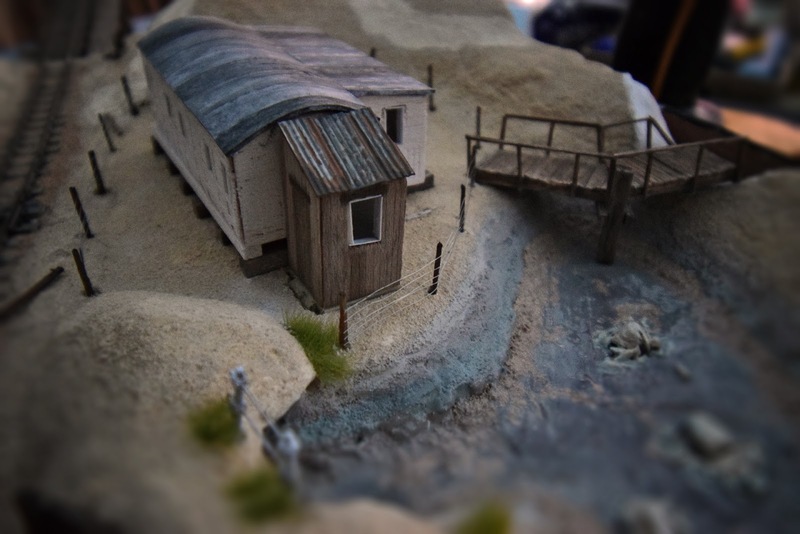 Happy with the roadway for now, I moved onto a glaringly obvious omission; a lack of paint on the water tank. I've been trying to find photos of heavily weathered rectangular water tanks for ages, but of the few examples I found, none were suitable for what I envisioned as they were all black or completely rust-covered; I wanted heavily weathered white. In the end I gave up searching, and went with my gut instinct. I of course used what little inspiration I had to come up with something which I hope is at least semi-realistic; severe rust on the edges, with patchy spots and streaks elsewhere. 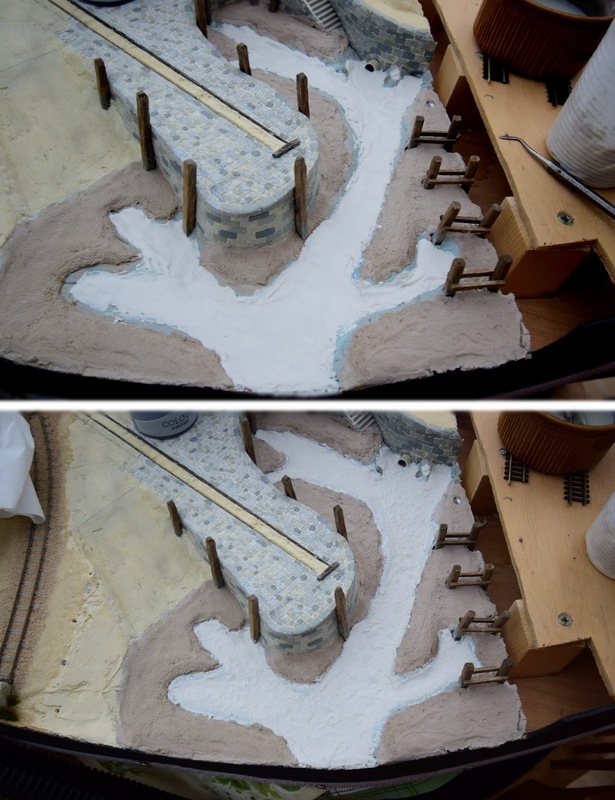 The process was simple, and the two top photos below show the only two stages. The edges were done first in a medium brown. Doing the edges first meant that the brush naturally ran out of paint by the time I got to do the splodges and streaks, which is good; I only wanted a tiny amount of paint to do these bits. The splodges were dabbed on with the brush, whilst the streaks, as you'd imagine, were very lightly brushed downwards. I could then do exactly the same with a slightly darker brown, but still allowing some of the medium brown to show through. 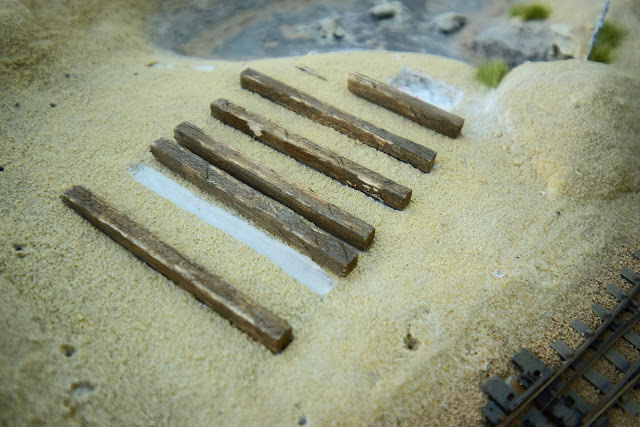 Keen to continue adding details to the layout, I decided it was about time I used up the spare sleepers I have lying in a box. After having taken all the webbing off, it was then time to paint them. 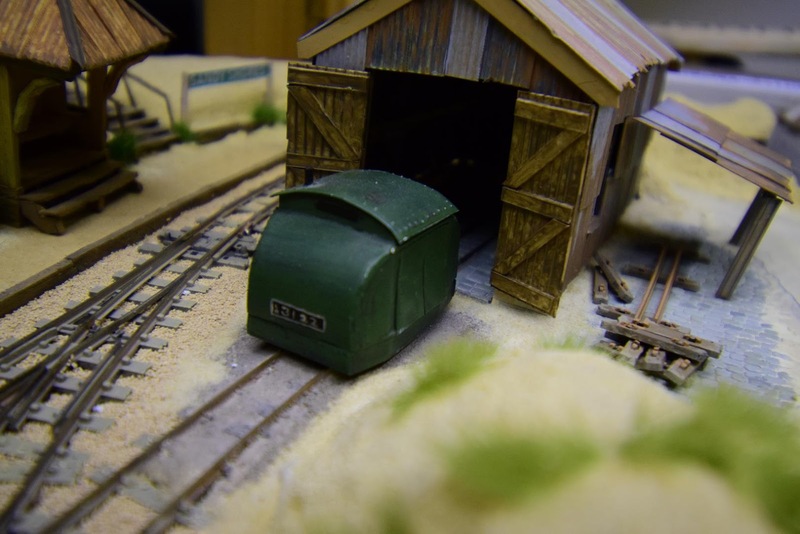 I absolutely hate the plastic sleepers; they're far too shiny to paint by normal means, which means I always use a spray can; in this case, a can of Plastikote Suede Tan (IIRC) which I've had since the very first iteration of Calshot, probably approaching 9 or 10 years ago by now! So with the horrible shiny plastic muted with a base colour, the weathering could begin. Again, the simpler, the better! Just a quick brush with darkish brown; taking care not to paint the edges so that they appear sunbleached. It could probably do with a light wash to improve this effect in all honesty, but it's good enough for me. Inspirational Bloggers - Thoroughly Recommend! Jamie Warne, 2016-2019. Simple theme. Powered by Blogger.